The immune system includes primary lymphoid organs, secondary lymphatic tissues and various cells in the innate and adaptive immune systems. The key primary lymphoid organs of the immune system are the thymus and bone marrow, and secondary lymphatic tissues such as spleen, tonsils, lymph vessels, lymph nodes, adenoids, and skin and liver. Leukocytes (white blood cells) act like independent, single-celled organisms and are the second arm of the innate immune system. The innate leukocytes include the phagocytes ( macrophages, neutrophils, and dendritic cells ), mast cells, eosinophils, basophils, and natural killer cells. These cells identify and eliminate pathogens and are also important mediators in the activation of the adaptive immune system. The cells of the adaptive immune system are special types of leukocytes, called lymphocytes. B cells and T cells are the major types of lymphocytes and are derived from hematopoietic stem cells in the bone marrow. The lymphatic system is a part of the circulatory system, comprising a network of conduits called lymphatic vessels. The lymphatic system has multiple functions such as the transportation of white blood cells to and from the lymph nodes into the bones. lymphocytes: A lymphocyte is a type of white blood cell in the vertebrate immune system. The three major types of lymphocyte are T cells, B cells and natural killer (NK) cells. T cells (thymus cells) and B cells (bursa-derived cells) are the major cellular components of the adaptive immune response. Leukocytes: Cells of the immune system involved in defending the body against both infectious disease and foreign materials. Five different and diverse types of leukocytes exist. The key primary lymphoid organs of the immune system include the thymus and bone marrow, as well as secondary lymphatic tissues including spleen, tonsils, lymph vessels, lymph nodes, adenoids, skin, and liver. The thymus “educates” T cells and provides an inductive environment for the development of T cells from hematopoietic progenitor cells. The thymus is largest and most active during the neonatal and pre-adolescent periods of development. By the early teens, the thymus begins to atrophy and thymic stroma is replaced by adipose tissue. Nevertheless, residual T-lymphopoiesis continues throughout adult life. Bone marrow is the flexible tissue found in the interior of bones. In humans, red blood cells are produced in the heads of long bones. The red bone marrow is a key element of the lymphatic system, being one of the primary lymphoid organs that generate lymphocytes from immature hematopoietic progenitor cells. Bone marrow and thymus constitute the primary lymphoid tissues involved in the production and early selection of lymphocytes. The lymphatic system is a part of the circulatory system, comprising a network of conduits called lymphatic vessels that carry a clear fluid, called lymph, unidirectionally towards the heart. The lymphatic system has multiple interrelated functions including the transportation of white blood cells to and from the lymph nodes into the bones, and the transportation of antigen -presenting cells (such as dendritic cells) to the lymph nodes where an immune response is stimulated. Lymphoid tissue is found in many organs, particularly the lymph nodes. The Lymph Nodes and Lymph Vessels in Human Beings: The lymphatic system is a part of the circulatory system, comprising a network of conduits called lymphatic vessels that carry a clear fluid called lymph. The spleen is similar in structure to a large lymph node and acts primarily as a blood filter. It synthesizes antibodies in its white pulp and removes antibody-coated bacteria along with antibody-coated blood cells by way of blood and lymph node circulation. The palatine tonsils and the nasopharyngeal tonsil are lymphoepithelial tissues located near the oropharynx and nasopharynx. These immunocompetent tissues are the immune system’s first line of defense against ingested or inhaled foreign pathogens. The fundamental immunological roles of tonsils aren’t yet understood. Lymph nodes are distributed widely throughout areas of the body, including the armpit and stomach, and linked by lymphatic vessels. 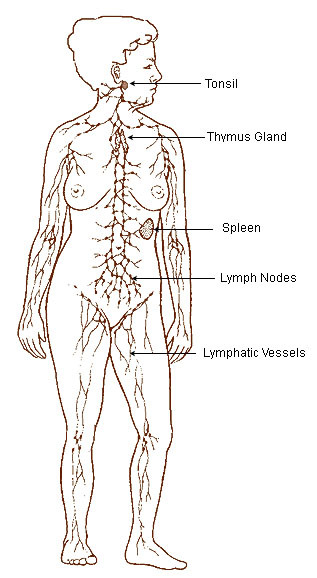 Lymph nodes are garrisons of B, T and other immune cells. Lymph nodes act as filters or traps for foreign particles and are important in the proper functioning of the immune system. They are packed tightly with the white blood cells, called lymphocytes and macrophages. The skin is one of the most important parts of the body because it interfaces with the environment, and is the first line of defense from external factors, acting as an anatomical barrier from pathogens and damage between the internal and external environment in bodily defense. Langerhans cells in the skin are part of the adaptive immune system. The liver has a wide range of functions, including immunological effects—the reticuloendothelial system of the liver contains many immunologically active cells, acting as a “sieve” for antigens carried to it via the portal system. Leukocytes (white blood cells) are immune system cells involved in defending the body against infectious disease and foreign materials. Five different types of leukocytes exist, all produced and derived from a multipotent cell in the bone marrow known as a hematopoietic stem cell. The innate leukocytes include the phagocytes, mast cells, eosinophils, basophils, and natural killer cells. These cells identify and eliminate pathogens and are important mediators in the activation of the adaptive immune system. Neutrophils and macrophages are phagocytes that travel throughout the body in pursuit of invading pathogens. Neutrophils are normally found in the bloodstream and are the most abundant type of phagocyte. During the acute phase of inflammation neutrophils migrate toward the site of inflammation and are usually the first cells to arrive at the scene of infection. Macrophages reside within tissues and produce a wide array of chemicals. They also act as scavengers, ridding the body of worn-out cells and other debris, and as antigen-presenting cells that activate the adaptive immune system. Dendritic cells are phagocytes in tissues that are in contact with the external environment, and are located mainly in the skin, nose, lungs, stomach, and intestines. These cells serve as a link between the bodily tissues and the innate and adaptive immune systems, as they present antigen to T-cells, one of the key cell types of the adaptive immune system. A Phagocyte in Action: Neutrophil engulfing anthrax bacteria. Taken with a Leo 1550 scanning electron microscope. Scale bar is 5 micrometers. Mast cells reside in connective tissues and mucous membranes, and regulate the inflammatory response. They are most often associated with allergy and anaphylaxis. Basophils and eosinophils are related to neutrophils. They secrete chemical mediators that are involved in defending against parasites, and play a role in allergic reactions, such as asthma. 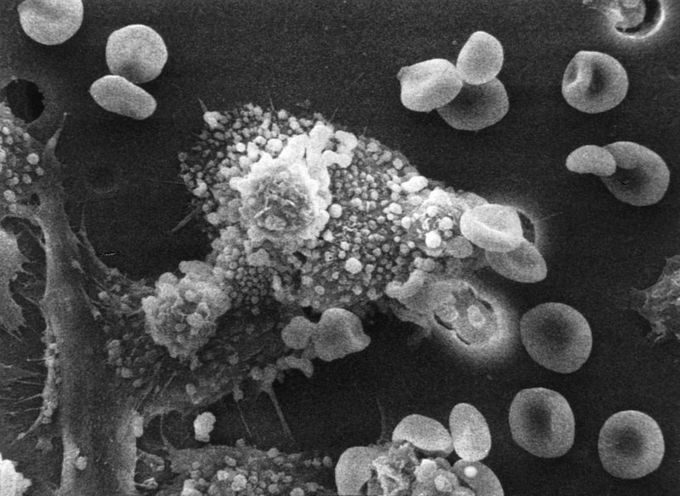 Natural killer cells are leukocytes that attack and destroy tumor cells, or cells that have been infected by viruses. 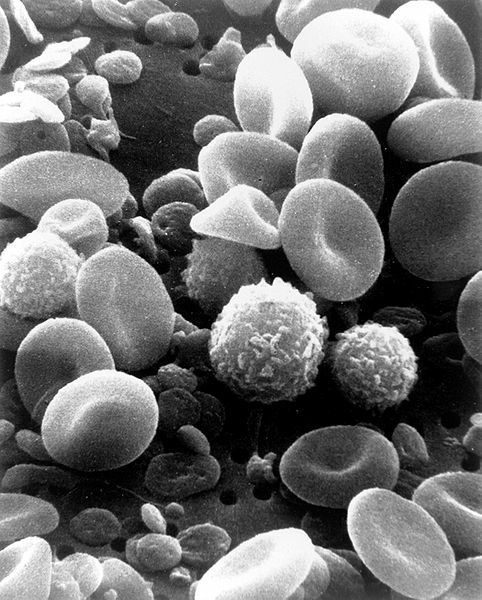 Blood Cells: Red blood cells, several white blood cells including lymphocytes, a monocyte, a neutrophil, and many small disc-shaped platelets. T cells recognize a “non-self” target, such as a pathogen, only after antigens have been processed and presented in combination with a “self” receptor, called a major histocompatibility complex (MHC) molecule. 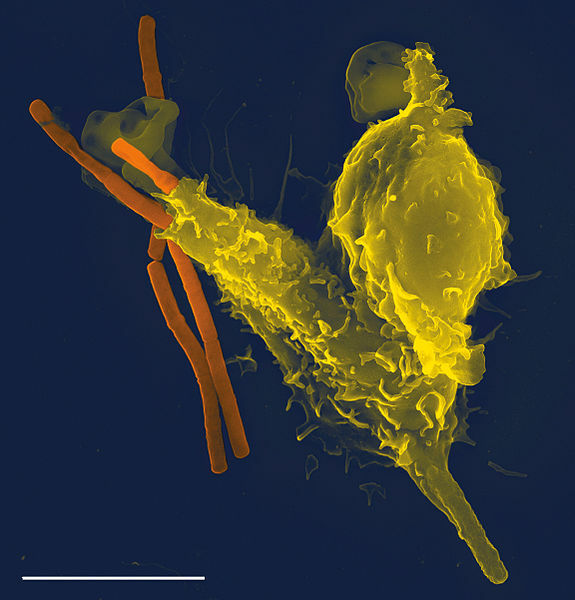 There are two major subtypes of T cells: the killer T cell, which kills cells that are infected with viruses (and other pathogens) or are otherwise damaged or dysfunctional, and the helper T cell, which regulates both innate and adaptive immune responses and helps determine which immune responses the body makes to a particular pathogen. These cells have no cytotoxic activity and do not kill infected cells or clear pathogens directly. A third, minor subtype are the γ T cells that recognize intact antigens not bound to MHC receptors. In contrast, the B cell antigen-specific receptor is an antibody molecule on the B cell surface, which recognizes whole pathogens without any need for antigen processing. Each lineage of B cell expresses a different antibody, so the complete set of B cell antigen receptors represent all the antibodies that the body can manufacture. Human-microbial interactions can be commensal or mutualistic, as with many types of gut flora, or harmful, as with pathogenic bacteria. Though people can survive without gut flora, the microorganisms perform a host of useful functions: fermenting unused energy substrates, training the immune system, preventing growth of harmful bacteria, regulating the development of the gut, and producing vitamins and hormones for the host. Organisms expected to be found in the human microbiome may generally be categorized as bacteria (the majority), archaea, yeasts, and single-celled eukaryotes as well as various helminth parasites and viruses. Skin flora are usually either commensal or mutualistic. The benefits of bacteria include preventing transient pathogenic organisms from colonizing the skin surface. Resident microbes can cause skin diseases and create life-threatening illness particularly in immunosuppressed people. Among the almost infinite varieties of microorganisms, relatively few cause disease in otherwise healthy individuals. Infectious disease results from the interplay between those few pathogens and the defenses of the hosts they infect. Primary pathogens cause disease as a result of their activity in the healthy host and their intrinsic virulence is due to their need to reproduce and spread. Organisms that cause an infectious disease in a host with depressed resistance are classified as opportunistic. The success of any pathogen depends on its ability to elude host immune responses. Therefore, pathogens evolved several methods that allow them to successfully infect a host, while evading the immune system. Human microbiome: The aggregate of microorganisms that reside on the surface and in deep layers of skin, in the saliva and oral mucosa, in the conjunctiva, and in the gastrointestinal tracts. They include bacteria, fungi, and archaea. Some of these organisms perform tasks that are useful for the human host. However, the majority have no known beneficial or harmful effect. Primary pathogen: These pathogens cause disease as a result of their presence or activity within the normal, healthy host. Their intrinsic virulence (the severity of the disease they cause) is due to their need to reproduce and spread. Opportunistic pathogen: Organisms which cause an infectious disease in a host with depressed resistance are classified as opportunistic pathogens. Opportunistic disease may be caused by microbes that are ordinarily in contact with the host, such as pathogenic bacteria or fungi in the gastrointestinal or the upper respiratory tract. They may also result from (otherwise innocuous) microbes acquired from other hosts or from the environment as a result of traumatic introduction. An opportunistic disease requires impairment of host defenses. The Human Microbiome Project (HMP) is a United States National Institutes of Health initiative aimed at identifying and characterizing the microorganisms which are found in association with both healthy and diseased humans. 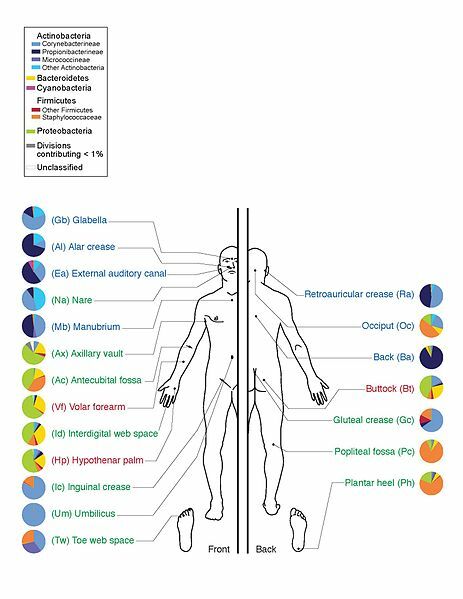 Bacteria commonly found in and on humans: This is a depiction of the human body and bacteria that predominates throughout it. Total microbial cells found in association with humans may exceed the total number of cells making up the human body by a factor of ten-to-one. The total number of genes associated with the human microbiome could exceed the total number of human genes by a factor of 100-to-one. Organisms expected to be found in the human microbiome may generally be categorized as bacteria (the majority), archaea, yeasts, and single-celled eukaryotes as well as various helminth parasites and viruses, such as those that infect cellular microbiome organisms. Bacterial protein -coding genes are estimated as 360 times more abundant than human genes. Microbial metabolic activities, for example, digestion of fats, are not always provided by the same bacterial species. Components of the human microbiome change over time, affected by a patient disease state and medication. Gut flora consists of microorganisms that live in the digestive tracts of animals and is the largest reservoir of human flora. The human body, consisting of about 10 trillion cells, carries about ten times as many microorganisms in the intestines. The metabolic activities performed by these bacteria resemble those of an organ, leading some to liken gut bacteria to a “forgotten” organ. Bacteria make up most of the flora in the colon and up to 60% of the dry mass of feces. Between 300 and 1000 different species live in the gut. It is probable that 99% of the bacteria come from about 30 or 40 species. Fungi and protozoa also make up a part of the gut flora, but little is known about their activities. The relationship between gut flora and humans is thought to be not merely commensal, but rather a mutualistic relationship. Though people can survive without gut flora, the microorganisms perform a host of useful functions, such as fermenting unused energy substrates, training the immune system, preventing growth of harmful, pathogenic bacteria, regulating the development of the gut, producing vitamins for the host, and producing hormones to direct the host to store fats. In certain conditions, some species can cause disease by producing infection or increasing the host’s cancer risk. The skin microbiota are composed mostly of bacteria of which there are around 1000 species upon human skin from 19 phyla. The total number of bacteria on an average human has been estimated at 1012. Skin flora are usually non-pathogenic and either commensal or mutualistic. The benefits of bacteria include preventing transient pathogenic organisms from colonizing the skin surface, either by competing for nutrients, secreting chemicals against them, or stimulating the skin’s immune system. Resident microbes can cause skin diseases and enter the blood system creating life-threatening diseases particularly in immunosuppressed people. Among the almost infinite varieties of microorganisms, relatively few cause disease in otherwise healthy individuals. Infectious disease results from the interplay between those few pathogens and the defenses of the hosts they infect. Infectious diseases comprise clinically evident illness resulting from the infection, and the presence and growth of pathogenic biological agents in an individual host organism. Infectious pathogens include some viruses, bacteria, fungi, protozoa, multicellular parasites, and aberrant proteins known as prions. Primary pathogens cause disease as a result of their presence or activity within the normal, healthy host. Their intrinsic virulence is due to their need to reproduce and spread. 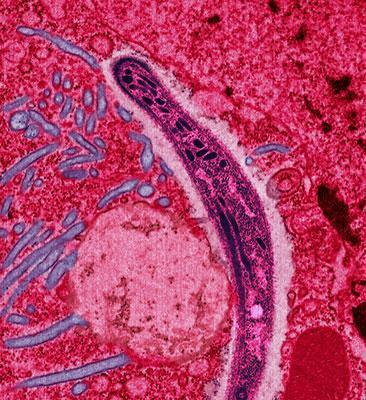 The malaria plasmodium: Malaria is transmitted to people and animals by mosquitoes. Malarial sporozoites develop inside oocysts and are released in large numbers into the hemocoel of Anopheles stephensi mosquitoes. This false-colored electron micrograph shows a sporozoite migrating through the cytoplasm of midgut epithelia. Organisms which cause an infectious disease in a host with depressed resistance are classified as opportunistic pathogens. Opportunistic disease may be caused by microbes that are ordinarily in contact with the host, such as pathogenic bacteria or fungi in the gastrointestinal tract. They may also result from (otherwise innocuous) microbes acquired from other hosts or from the environment as a result of traumatic introduction (as in surgical wound infections). An opportunistic disease requires impairment of host defenses, which may occur as a result of genetic defects, exposure to antimicrobial drugs or immunosuppressive chemicals, exposure to ionizing radiation, or as a result of an infectious disease with immunosuppressive activity. The success of any pathogen depends on its ability to elude host immune responses. Therefore, pathogens evolved several methods that allow them to successfully infect a host, while evading the immune system. Bacteria often overcome physical barriers by secreting enzymes that digest the barrier. An evasion strategy used by several pathogens to avoid the innate immune system is to hide within the cells of their host. The mechanisms used to evade the adaptive immune system are more complicated. The simplest approach is antigenic variation: rapid changes of non-essential epitopes on the surface of the pathogen, while keeping essential epitopes concealed. Pathogens can rapidly evolve and adapt to avoid detection and neutralization by the immune system. As a result, multiple defense mechanisms have also evolved to recognize and neutralize pathogens. The immune system protects from infection with layered defenses of increasing specificity. Physical barriers prevent pathogens from entering the organism. If these barriers are breached, the innate immune system provides an immediate, non-specific response. If pathogens successfully evade the innate response, vertebrates possess a second layer of protection, the adaptive immune system. Immunity is a biological term that describes a state of having sufficient biological defences to avoid infection, disease, or other unwanted biological invasion. Innate, or nonspecific, immunity is the natural resistance with which a person is born. It provides resistance through several physical, chemical, and cellular approaches. Adaptive immunity is often sub-divided into two major types acording to how the immunity was introduced. Naturally acquired immunity occurs through non-deliberate contact with a disease causing agent, whereas artificially acquired immunity develops through deliberate actions such as vaccination. Immunology is a branch of biomedical science that covers the study of all aspects of the immune system in all organisms. It deals with the physiological functioning of the immune system in states of both health and disease. Adaptive (acquired) immunity: The creation of immunological memory after an initial response to a specific pathogen, leading to an enhanced response to subsequent encounters with that same pathogen. This process of acquired immunity is the basis of vaccination. Innate immunity: The natural resistance with which a person is born. It provides resistance through several physical, chemical, and cellular approaches. Self molecules: Those components of an organism’s body that can be distinguished by the immune system from foreign substances. The immune system is a system of biological structures and processes within an organism that protects against disease. To function properly, an immune system must detect a wide variety of agents, from viruses to parasitic worms, and distinguish them from the organism’s own healthy tissue. Pathogens can rapidly evolve and adapt to avoid detection and neutralization by the immune system. As a result, multiple defense mechanisms have also evolved to recognize and neutralize pathogens. Even simple unicellular organisms, such as bacteria, possess a rudimentary immune system in the form of enzymes that protect against bacteriophage infections. Other basic immune mechanisms including include phagocytosis, antimicrobial peptides called defensins, and the complement system, which evolved in ancient eukaryotes and remain in modern descendants, such as plants and insects. Jawed vertebrates have even more sophisticated defense mechanisms, including the ability to adapt over time to recognize specific pathogens more efficiently. Adaptive (acquired) immunity creates immunological memory after an initial response to a specific pathogen, leading to an enhanced response to subsequent encounters with that same pathogen. This process of acquired immunity is the basis of vaccination. The immune system protects organisms from infection with layered defenses of increasing specificity. Physical barriers prevent pathogens, such as bacteria and viruses, from entering the organism. If a pathogen breaches these barriers, the innate immune system provides an immediate, but non-specific response. Innate immune systems are found in all plants and animals. If pathogens successfully evade the innate response, vertebrates possess a second layer of protection, the adaptive immune system, which is activated by the innate response. The immune system adapts its response during an infection in order to improve its recognition of the pathogen. This improved response is then retained after the pathogen has been eliminated, in the form of an immunological memory, and allows the adaptive immune system to mount faster and stronger attacks when this pathogen is encountered. Both innate and adaptive immunity depend on the ability of the immune system to distinguish between self and non- self molecules, where self molecules are those components of an organism’s body that can be distinguished from foreign substances by the immune system. 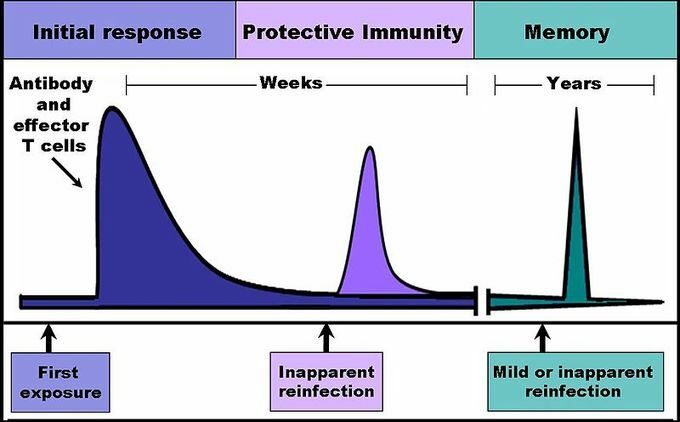 The Time Course of an Immune Response: Immune reactants, such as antibodies and effector T-cells, work to eliminate an infection, and their levels and activity rapidly increase following an encounter with an infectious agent, whether that agent is a pathogen or a vaccine. For several weeks these reactants remain in the serum and lymphatic tissues and provide protective immunity against reinfection by the same agent. During an early reinfection, few outward symptoms of illness are present, but the levels of immune reactants increase and are detectable in the blood and/or lymph. Following clearance of the infection, antibody level and effector T cell activity gradually declines. Because immunological memory has developed, reinfection at later times leads to a rapid increase in antibody production and effector T cell activity. These later infections can be mild or even inapparent. Immunity is a biological term that describes a state of having sufficient biological defences to avoid infection, disease, or other unwanted biological invasion. Immunity involves both specific and non-specific components. Immunity: Natural immunity occurs through contact with a disease causing agent, when the contact was not deliberate, where as artificial immunity develops only through deliberate actions of exposure. Both natural and artificial immunity can be further subdivided, depending on the amount of time the protection lasts. Passive immunity is short lived, and usually lasts only a few months, whereas protection via active immunity lasts much longer, and is sometimes life-long. Innate, or nonspecific, immunity is the natural resistance with which a person is born. It provides resistance through several physical, chemical, and cellular approaches. Microbes first encounter the epithelial layers (physical barriers that line our skin and mucous membranes). Subsequent general defenses include secreted chemical signals (cytokines), antimicrobial substances, fever, and phagocytic activity associated with the inflammatory response. The phagocytes express cell surface receptors that can bind and respond to common molecular patterns expressed on the surface of invading microbes. Through these approaches, innate immunity can prevent the colonization, entry, and spread of microbes. Adaptive immunity is often sub-divided into two major types depending on how the immunity was introduced. Naturally acquired immunity occurs through contact with a disease causing agent, when the contact was not deliberate, whereas artificially acquired immunity develops only through deliberate actions such as vaccination. Both naturally and artificially acquired immunity can be further subdivided depending on whether immunity is induced in the host or passively transferred from an immune host. Passive immunity is acquired through transfer of antibodies or activated T cells from an immune host, and is short lived—usually lasting only a few months. Active immunity is induced in the host itself by antigen, and lasts much longer, sometimes the entire lifetime. A further subdivision of adaptive immunity is characterized by the cells involved; humoral immunity is the aspect of immunity that is mediated by secreted antibodies, whereas the protection provided by cell-mediated immunity involves T lymphocytes alone. Humoral immunity is active when the organism generates its own antibodies, and passive when antibodies are transferred between individuals. Similarly, cell-mediated immunity is active when the organism’s own T cells are stimulated and passive when T cells come from another organism.